The design of your commercial kitchen can mean the difference between a seamless workline and a disorganized bottleneck in your workspace. Our professional designers will alleviate any of these situations by altering the configuration of your kitchen setup! While we’ll look at your individual kitchen’s space allotments and equipment needs, the setup for each restaurant will be designed on an individual basis. Here’s some insight into the details behind the configuration of your kitchen. While you may sacrifice energy efficiency in this setup, an ergonomic configuration will ensure maximum chef and staff comfort, which helps to increase the work output of your employees. For instance, it may be easiest for your staff to access frozen items beside where they are to be cooked (such as a fryer) but putting a cooling unit next to a cooking unit is one of the least energy efficient setups. The upside is that your staff won’t even have to take more than a step or two to transfer your frozen product to the cookline! For restaurants whose products are generally of one type (think: pizzas and sandwiches), the assembly-line configuration is best. In this setup, equipment is arranged according to their sequence of use. 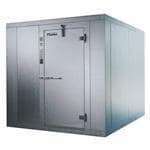 If you’re a pizzaria, your setup may start with your walk-in unit where dough is stored. Then, your dough-shaping area followed by pizza prep table and pizza deck oven are arranged. Finally, your warming and holding area finishes the assembly-line. This configuration delegates zones of your kitchen. Some standard ‘zones’ include food prep zone, cooking zone, refrigeration/ice machine zone, sanitation/ware-washing zone, and a kitchen-to-server transition area. In larger kitchens, there may be multiple blocks for the same zone! As the name implies, island-style configuration uses an ‘island’ in the middle of the kitchen. This is generally reserved for cooking, while the outer walls house prep and transition areas. The reverse may also be true, with prep and transition in the middle and cooking on the outer walls. While you may immediately be drawn to a certain configuration, work with your professional designer to create the best layout for your restaurant.